The Mets need to resolve this offseason whether Ike Davis or Lucas Duda is their 2014 first baseman.NEW YORK -- If you were the Mets, and you planned to only retain one, would you rather Ike Davis or Lucas Duda as your 2014 first baseman? That was the question posed to a handful of scouts. A statistical comparison of Ike Davis and Lucas Duda in 2013. The responses have Duda with a 7-2 lead. Scout 1: "Duda. Ike has not shown the ability to make adjustments with his batting stance or overall approach. Duda at first base has improved, and he looks more relaxed." Scout 2: "Tough call. I'm not thrilled with either, but would probably take Davis, because of the power potential and defense at first base." Scout 3: "Duda. He is better project than Ike." Scout 4: "Ike Davis. He has hit 30-plus homers in the major leagues and is much better defensively." Scout 5: "For me it would be Duda. At least in New York City. He appears to be less maintenance with similar power and offensive capabilties and less strikeouts." Scout 6: "Duda. If I need a hit late in the game with a runner on second or third, Duda will go to left field if they pitch him away. The other guy won't." Scout 7: "Really not a fan of either guy, but to answer your question: Duda, because more versatility defensively and less holes offensively!" Scout 8: "Tough call. Probably Duda." Scout 9: "I would keep Duda because he seems willing to learn and has power upside. Ike's head won't let him progress like he should." Certain Mets officials have strong leanings as to their preference, but the organization is likely to shop both this offseason and see who may command the superior package that would fill another hole. That said, because Duda has an option, if neither is traded, Duda could open the season with Triple-A Las Vegas. 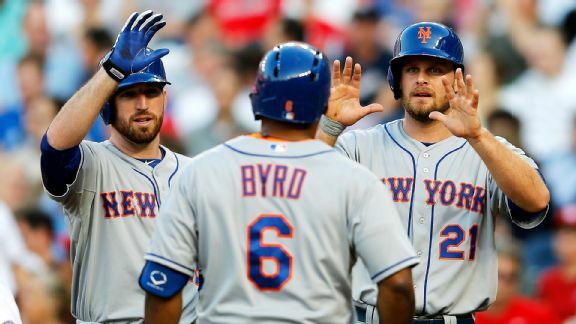 Who would you want starting for the Mets at first base in 2014?